Listen to The Voxx Show, Live! Listen to Voxx, Live on the Internet! It's easy! Call Voxx with a specific question. Make sure to have your Birthdate info on-hand. Calls will be answered in the order received. Visit the NEW Voxx Site and Blog and Podcasts! I've just finished work on my NEW website! Visit me at Voxx.org for a super fun experience. The site's way easier to navigate, and is very accessible and user friendly. The site's in the form of a Blog, and you can leave comments and questions for me there regarding the interesting articles you're sure to find. You can always reach me at my regular email address, but the new address is MUCH simpler! Write to me there via the contact form. Also, check out my new Podcasts too! Remember to do a Full Moon Ritual to awaken the Libra/Venusian influence in your life. This is good for 7th House Concerns, such as: Marriage, Relationships, Legalities, and Partnerships. Also, as soon as the Moon passes into its Full Phase, it would be a good time to release anyone or anything that will serve a good purpose in your life. NEW MAGICK INCENSES PAGES: I'm happy to announce that I've just added my new Magickal Incenses Index Pages for all of you who have been requesting me to start selling my personal Magickal Blended Incenses! I have every kind of oil available! Buy some today! NEW MAGICK OILS PAGES: I'm happy to announce that I've just added my new Magickal Oils Index Pages for all of you who have been requesting me to start selling my personal Magickal Blended Oils! I have every kind of oil available! Buy some today! New pages are added weekly. So, check back often. Check what's going on Astrologically by reading the new Voxx the Psychic Blog (check this one first!) or her Voxx at MySpace blog. Find out the news that will affect your life for the next few months! Remember, the two-week period after the Full Moon phase is considered the Waning Phase. This is a great time to perform powerful Magickal Rituals to RELEASE all negativity into your life ... buy a Magickal Spell Kit today! Listen to Voxx's Music On MySpace! If you're a fan of MySpace, feel free to visit Voxx's MySpace music site here: MySpace: Telegenetic. The site, features samples of the music and lyrics of Voxx and Telegenetic. You can inquire about purchasing the new CD by writing to info (at) telegenetic (dot) com. The CD is already receiving airplay. Show your support on the new site, and let Voxx know what you think about their music. Remember to register on the Forum of the Official Site. Buy Voxx's Newest Magickal Books! NEW! VOXX MAGICKAL BOOKS: New titles currently available exclusively at the Voxx Online Bookstore. There are 6 in all; check them all out here! Finally, I've got a new Voxx the Psychic Blog located on MySpace.com -- I'm really enjoying meeting lots of new friends and doing on-line chats there. Please visit my new Blog page, and send me your psychic stories and comments. It's simple to keep in touch with me that way too! See you there! New Voxx Offical Magickal Forum - Finally Here! Offical Voxx.Org Magickal Forum: This is the newest forum I've started recently -- here you will find a comprehensive forum dedicated to the study and discussion of all my favorite Magickal subjects, such as: The Tarot, Astrology, Numerology, Goetia, Angels, Superstitions, Wicca, Enochian, Thelema, and much more! New Forum #1) Book of Thoth: This is the newest forum I've started recently -- it's dedicated to the study of the Book of Thoth Tarot Deck. As it's a private group, please read the following info regarding how to join. To Join:, Please click on the link, add me to your friend's list, and send an email, expressing your interest. The Book of Thoth Forum, Learn more about the Magickal legacy of Aleister Crowley with Voxx and a great group of serious students and magickal practitioners. It's free! New Forum #2) The Magick of Thelema: I've recently started a few new Magickal Forums on MySpace dedicated to the study and practical application of Thelemic Magick. For more details, read below. To Join:, Please click on the link, add me to your friend's list, and send an email, expressing your interest. The Magick of Thelema Forum: Thelemagus, Learn more about the Magickal legacy of Aleister Crowley with me and a great group of serious students and magickal practitioners. It's free! New Forum #3) Magick Without Tears: Another new forum on MySpace is dedicated to the study and practical application of General Magick and is for Beginner's only! To Join:, Please click on the link, add me to your friend's list, and send an email, expressing your interest. Magick Without Tears Forum: Magick For Beginners, Learn more about the study and practice of Ritual Magick, as prescribed by Aleister Crowley (and taught by me). It's another great group of novice, but serious students and magickal practitioners. It's free! For those of you interested in furthering your knowledge of Magick and Metaphysics, I teach an incredible variety of on-going classes. Contact me for more info! 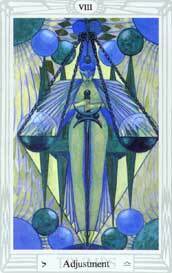 Tarot Class - Visit the Class link for details, and to view the Class Syllabus. These classes are conveniently taught on-line, by phone, and/or in-person. Group rates are available. [Note: If you live within 50 miles of Los Angeles, I will consider teaching your group at a convenient location]. Psychic Development - Visit the Class link for details, and to view the Class Syllabus. These classes are conveniently taught on-line, by phone, and/or in-person. Group rates are available. [Note: If you live within 50 miles of Los Angeles, I will consider teaching your group at a convenient location]. 've recently started a new forum on MySpace dedicated to the study and practical application of Thelemic Magick. To Join, please click on the link, add me to your friend's list, and send an email, expressing your interest. The Magick of Thelema Forum: Thelemagus, Learn more about the Magickal legacy of Aleister Crowley with Voxx and a great group of serious students and magickal practitioners. It's free! Greetings all! I hope you all will have a wonderful, prosperous and healthy Solar Year. Remember to schedule your next psychic reading to find out what the year has in store for you. You can also order your 2007 Astrology Chart. Remember to purchase a Gift Certificate for your loved ones this year! My Magickal Spell Kits make fantastic gifts for the magickally inclined. Visit the Voxx Store for more info! Contact Voxx to schedule a private chat, request rates. Despite the power of the Planets, Astrology is merely an indicator of energies -- remember it is acting on our True Wills that decides the course of events in our lives. Try to focus on sending your most positive, healing energy into the world at least once a day. Energy is Magick, and your thoughts are powerful beacons of light that can change the world. Many blessings to you all! Have a mystical, magickal day! Please visit Voxx's new music site here: Telegenetic. The site, features the music and lyrics of Voxx and Telegenetic. Order Voxx's new 6-Song CD. The CD is already receiving airplay. Show your support on the new site, and let Voxx know what you think about their music. Remember to register on the Forum. Check Out Voxx's Music On MySpace! If you're a fan of MySpace, feel free to visit Voxx's MySpace music site here: MySpace: Telegenetic. The site, features samples of the music and lyrics of Voxx and Telegenetic. You can Order Voxx's new 6-Song CD on MySpace, or at the Official Telegenetic site. The CD is already receiving airplay. Show your support on the new site, and let Voxx know what you think about their music. Remember to register on the Forum of the Official Site. Voxx has several up-coming events that will be open to the public and her many Metaphysical students. CLASSES: Voxx will be hosting several on-line Metaphysical classes! Please visit the Classes page for info on how to subscribe to this unique service. Classes can be conveniently paid for by credit card, via our PayPal service. Voxx is known as one of the world's most trusted, and knowledgeable Psychic Instructors. e-mail us for info regarding dates, times and locations. NEW! VOXX MAGICKAL BOOKS: New titles currently available exclusively at the Voxx Online Bookstore: There are 6 in all; check them all out here! THE VOXX STORE: The Voxx Store is in the process of opening for business. Voxx is the owner of several lines of specialty candles, oils and incenses. Voxx personally creates her magickal products according to ancient Kabbalistic and Magickal formulas, utilizing the most effective colors and scents. Be sure to stop and shop at the Voxx Store for all your magickal needs. VOXX VIDEOS: Voxx is in the process of creating a series of videotapes and DVD's containing lessons on several Metaphysical subjects, including Tarot, Candle Magick, Wicca, Kabbalah and Practical Magick. Several more titles will be available for purchase later this year.